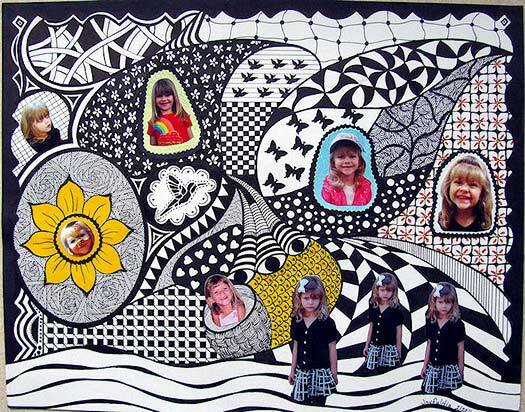 The doodle art of Dia Stafford wiggles and dances across the paper, flowing with fun and whimsy. Using primarily pen on paper, her detailed abstract designs are striking for both their playfulness and their neatness and precision of line. Dia's doodles are primarily abstract, but many pieces have a fun twist - such as doodles in the stylized shapes of fish or people that are filled with her fun patterns. She also explores alternative surfaces for her doodles, such as fabric tote bags, envelopes and paper plates. On this page you'll see many examples of Dia's joyful doodle art, including in-progress images of one of her doodles from start to finish. I grew up in Costa Mesa, CA, USA and lived in Prescott, AZ for the decade of the 70's back when it was a charming little town. Colorado Springs has been my home for 31 years. The only thing we're missing here is accessibility to the ocean. We have an inspiring view of Pikes Peak and the mountains year around, and it's just a few minutes to lakes and mountain trails. Since forever, however until the last few years I didn't consider myself as an artist. My parents were both creative and painted in oil so art seemed a natural part of life. Dad also sketched in charcoal and encouraged me to do the same during my sixteenth year. In 2005 a friend suggested I take up a hobby where I could get "lost in time." After experimenting with various mediums I finally settled into pen & ink, although I enjoy branching out every so often. I've got so many ideas I want to try and I enjoy experimenting with other mediums. Do you have an art education (college, workshops, classes, etc) or are you self-taught? I've been totally self taught until this spring when I took a pen & ink class at our local senior center. It's been interesting attempting to draw in the more classical form. I can do it, but miss the freedom and spontaneity flowing from my heart to my hand and watching it take form. When I began drawing in the current style, I hadn't seen anyone else doing this kind of art so I didn't have a name for it. I just called it doodling, not realizing it could even be called art. It was two years before I came across others doing the same type of drawing, in their own style, and also refer to their work as doodling. I didn't take what I was doing seriously—I was just having fun. 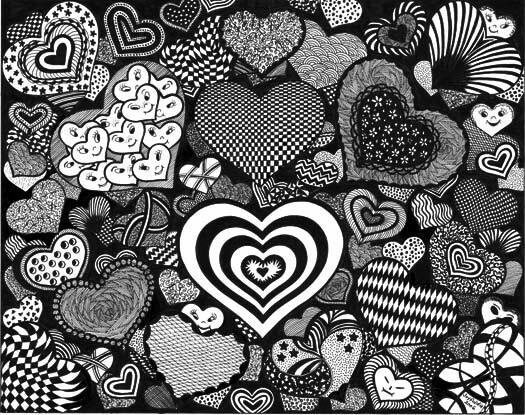 Can you spot the faces hidden in the hearts? Art for me is a form of meditation and part of my spiritual journey. Many of my drawings are streams of consciousness where I "zone out" for a while. For the doodle doodles I seldom plan. I just take a pencil and start moving my hand and if I like the squiggle I pick up the pen and see what happens. For other drawings I spend a lot of time and study, wanting to perfect my work. Either way, the finished drawing is always somewhat of a surprise after working around various forms of mishaps. The nature of pen & ink is unforgiving and that challenge is part of the fun. Every once in a while I need to try something different and will doodle on objects or work a piece in mixed media. I've dabbled a bit in watercolor, but really need to take a class. While pen & ink will probably be my mainstay, I don't want to get into a rut. What size range do you typically work in? What's the smallest doodle art you've ever made? The largest? The smallest doodle is probably about 1" x 1". I've drawn several 19" x 24", but normally use either 9" x 12" or 11" x 14". The smaller sizes are easier to photograph and upload to the website. Anything larger loses too much detail when reduced. And I do enjoy web mastering. Sometimes I draw just so I can have something to upload. What are your favorite brand(s) of pens or markers to use for your doodles? Currently I'm using the Sakura Micron pens because they do a decent job for being cost effective. Another critical tool for me is the Pencil Grip, for without them my hands wouldn't be up to the hours of drawing. They are fat, ergonomically correct, and fit on the Micron pens I use. I purchase them locally at an educational supply store, but they are also available online and at some art stores. The creative process, then the surprising end result. Our hallway is a showcase for nine of my earlier works and when I see them I'm still amazed they are my creation. Secondly, whenever someone reacts to my work by thinking, "Oh, I could do that!" To inspire them to pick up a pen, find their own style, and experience the joy of art. Perhaps it will be the beginning of a new life's adventure! Who are some artists you admire and why? That's a difficult question because I enjoy and appreciate creativity in all forms. My very favorite artist is Cicely Mary Barker, the famous self-taught fairy artist. A couple of weeks ago I took samples of her art to my illustration class to share with classmates and our instructor ended up using her examples to teach that day. Needless to say, I came away with even greater appreciation for Cicely's work. I have all of her work and one of her pieces hanging in my office. I also admire the work of my art instructor: Darcy Lee Marquis. Loved Monet since I can remember, but I have no interest in creating his kind of art. Grew up with Norman Rockwell and still consider him a favorite outstanding artist. I stumble upon so many creative artists as I peruse the internet, and just look at the variety of artists on this website alone. They are all wonderful, all different, and all inspire my creative juices. Perhaps the most influential person for this life stage was Judith Cornell. Her book, Drawing from the Light Within: Keys to Awaken Your Creative Power, was a huge influence back when I was just discovering myself as an artist. It broke the power of the need to be perfect and set me on my current path. I began drawing in pencil, which I love because of shading, erasing for highlights, and ease of correction. I switched over to pen & ink only because I wearied of the need to constantly redraw due to smudging in spite of using protective paper under my hand. It was because of Judith's influence that I launched out, pen in hand, daring to be different, and unconcerned with the end result. Play with an assortment of mediums until you find what feels right, but always be open because the future may hold surprises. Practice, persevere, and practice some more. Have fun and enjoy the process—even the pieces that seem like goofs are all part of the learning. 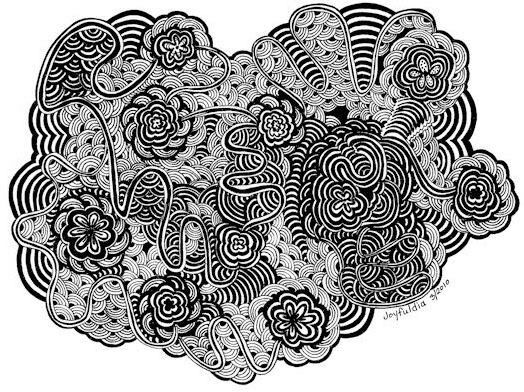 Thank you so much to Dia Stafford for this fabulous interview and for sharing her inspiring doodle art with us!